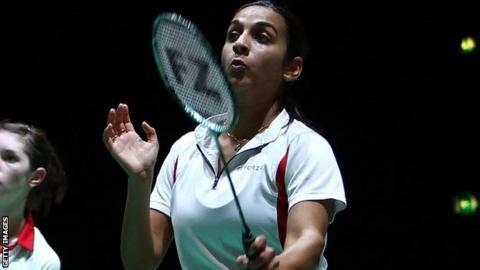 Former England internationals Mariana Agathangelou and Mark Constable have been named in Jersey's badminton squad for the Island Games. Constable, who won Commonwealth gold with England in 2002, will captain the side which includes Alex Hutchings, Jon Southern, Dave Luce and Colin Hardwidge. Agathangelou, meanwhile, is set for her first Island Games in a decade. She won golds in 2005 in the singles, doubles, mixed doubles and team event. Kerry Coombes-Goodfellow, Emily Temple-Redshaw, Moira Ashby and Jade Coombes-Goodfellow make up the rest of the squad. Channel Island rivals in March, while claiming Jersey would be the medal favourites. The multi-sport Games, with 24 islands set to compete, runs from Saturday, 27 June to Friday, 3 July in Jersey. Men's: Mark Constable (team captain and coach), Alex Hutchings, Jon Southern, Dave Luce and Colin Hardwidge. Women's: Mariana Agathangelou, Kerry Coombes-Goodfellow, Emily Temple-Redshaw, Moira Ashby and Jade Coombes-Goodfellow.